A Saltford schoolboy who stunned medics with his complex suggestion for altering DNA to fight cancer has been paid a visit by leading researchers at his primary school. Nine-year-old Oscar Sawyer impressed scientists working at Cancer Research UK when he wrote to the charity to share his idea for a cure after losing his grandfather to the disease. 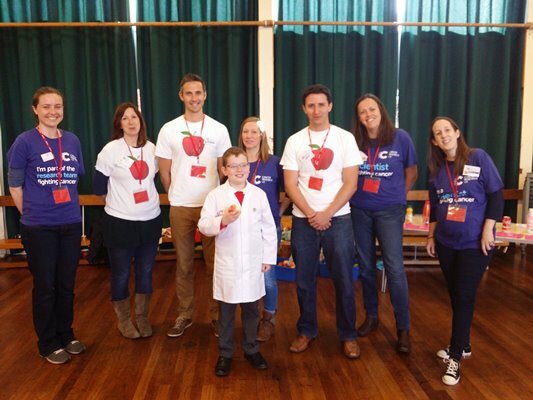 Wanting to inspire young cancer researchers of the future, a team from Cancer Research UK and the University of Bristol dropped in at Saltford Primary School where they held a series of workshops for Oscar and his classmates. His idea, which he described to his mother at the age of just eight, was to take DNA from slow-growing cells and put it in a person with cancer so that the cancerous cells would grow more slowly and allow more time for the cells’ DNA checkers to spot the faults and fix them. Dr Samuel Godfrey, science communications manager at Cancer Research UK, said: “We have never received such a clever idea from a child of Oscar’s age. He has really taken the time to think it through logically. "Although we can’t directly use slow-growing cells to treat cancer, elements of his ideas are being used in existing treatments that target faulty DNA or help to slow the growth of cancer cells. We suggested he might like to turn his attention to fixing a molecule called P53 which often goes wrong in cancer cells. Oscar’s mum, Jo Chambers, said: “Oscar has always been really interested in genetics and wants to learn as much as he can about it. He was over the moon to get a reply from Cancer Research UK, his face was a picture as he read the letter.